Usecase: Admin wants to send BO pdf Summary as a part of workflow. He needs to ensure that he has the possibility to select the right template and language for the pdf summary while defining workflow rules to ensure that template and language are suited for end user. It also provides a posisblilty for customer to write custom code for template & language determination if customer does not want to use standard feature. 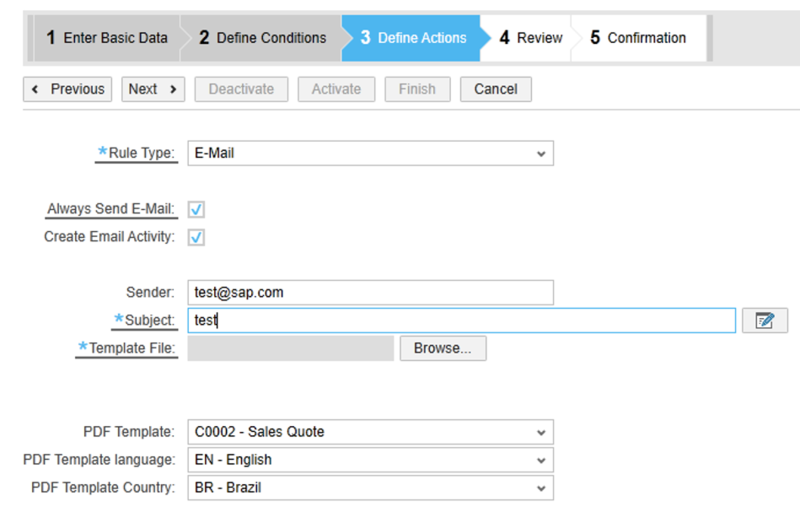 Create a Workflow Rule for a BO, say Sales Quote, for which “Form Group Code” is defined. Check the checkboxes ‘Always Send E-mail’ and ‘Create Email Activity’. Add the ‘Employee’, recipient to whom the mail should be sent. Click on ‘Next’, Click on ‘Activate’, Click on ‘Finish’. Goto Workcenter View for ‘Sales Quote’, Create a New Sales Quote and click Save. The ‘Employee’ configured will receive a mail with the PDF document (pdf Summary of Sales Quote, in the language selected by the Admin User) attached. Open the activity created for your email, Goto Tab ‘Attachments’, you should see the generated PDF. Case 2: Form Template Code maintained by Key user, the variant to be picked from PDI BADI. UUID of the BO Instance. List of valid variant for selected for template, with an ‘index’ generated for each variant. The BADI specifies the Variant by specifying the ‘Index’. This BADI is called if the Key user , while defining the workflow rule , has defined only the Form Template Code. Filter of the BADI is the name of the ‘Workflow View of Business Object’ you have used while defining the Workflow rule. User can choose if they want to go for Manual Selection on UI while creating Workflow Rules or use Custom Implementation to choose pdf summary. If ‘Custom Implementation’ is chosen, the ‘PDF Variant Language’ and ‘PDF Variant Country’ fields are cleared. Cointinue with the test by selecting the PDF Form Template, PDF Form Variant Selection as ‘Custom implementation’. Repeat the above steps, PDF should be generated according to the specified variant in the BADI Implementation.